Author to Turkish Delights to Appliqué, Bended Bias Appliqué and Quilted Fairie Tales. Thanks Michele for having me as Guest Blogger this month, it’s such an honor, and a warm welcome to all the bloggers out there for taking the time to read about a slightly compulsive little girl turned professional quilter by chance! As a little one, my parents needed to keep me busy. I wanted to know everything. Why can’t fish walk? Why can’t we have pizza every day? Why can’t I have my own pair of scissors like mom and Nona (Italian for grandmother) have? I am a first generation American, my dad is from Northern Germany and my mom’s heritage is Northern Italian. Luckily, my Italian Nona lived with my family and I received some of the best projects to do from her. I was given those scissors I so dearly wanted at age 4, along with floss, needles and fabric marked with those big X’s on them to embroider. Remember those pillow cases and hand towels? I breezed through the embroidery and weaved little crooked potholders everyone got for Christmas. Next I was taught knitting and crocheting and anything else that required occupying my time. I was eager to learn! But the time spent with my Nona at her Singer treadle machine were pure bliss for me. Nona mended sheets as I sat on the floor making the treadle move up and down. Hmmm….nonni was a smart lady! But then I graduated to sitting on her lap and push the fabric under the needle. I was hooked. I could take two pieces, sew them together and make stuff…wow! Fast forward a few years…..I loved cutting stuff apart, magazines, paper dolls, pictures, books (oops), anything I could get my hands on. I now call it the beginning of collage scrapbooking in the late 60’s. Luckily, my parents encouraged anything I did artistically. I come from a long line of multi generations of artists. My paternal grandmother (Oma in German) was a poet, sculptress, doll maker and weaver. My paternal grandfather was a professor of the arts who studied with Picasso in France and together they hiked the Dolomite Mountains sketching the beauty they saw. Opa was an amazing impressionist artist who oil painted many famous people and places in Germany, Italy and Denmark. Together they had a weaving studio on their property, worked on stained glass windows for churches, sculpted beautiful figures and wrote poetry. My most prized possession was one of the last oil painting brushes my grandfather used. They truly lived the lives of an artist. My father continued the artist’s lineage. He is a silversmith for Tiffany & Co, expertly transforming a single piece of silver into things we know; The super bowl trophy, Kennedy’s Profile and Courage Award, The Breeder’s Trophy to name a few. It wasn’t till many years later, in my later 20’s that quilting caught my attention. I was consumed. I couldn’t have enough fabric, or scissors. Those were the days that rotary cutters and mats did not exist. Templates were made, fabric squares were painstakingly cut and then finally piecing could be done. Yikes! I’m aging myself. Of course, all the great gadgets emerged and I welcomed them! I moved from Northern New Jersey to be closer to my parents who now lived in NE Pennsylvania. Mom and I heard a quilt guild just formed, so we joined. It was nice that I got to share my passion of quilting with mom. She had no idea how quickly she would be bitten by that quilt bug. I became very active in my guild, The Milford Valley Quilters Guild, holding just about every office, except for treasurer. Luckily, being of European heritage, I traveled to Europe quite often to see family and one year mom and I went to Quilt Expo in Austria. I befriended many quilters from many nations and became good friends with a gal from Turkey, Gunsu. We sent each other letters by mail then, the Internet was just starting to catch on amongst quilters. We arranged to have an American-Turkish exhibit between my guild and hers. It was a hit. Newspapers and Quilt magazines published stories about it. Gunsu came to America to see the exhibit at my guild’s quilt show. A few months later, I received a letter from the Turkish Minister of Culture inviting me to represent America, one of the eleven nations invited to teach at their first quilt show in Turkey. I fell in love with Turkish art. I loved it so much, that I returned there two more times to teach and study the art. I began designing appliqué patterns from the inspirations I saw and submitted a book proposal to AQS (American Quilters Society). It was accepted two weeks later, and my professional quilting career began. The books was named "Turkish Delights to Appliqué", a book I am immensely proud of, which is now on CD. I am inspired by everywhere I go. I look for the small things, the things that most people don’t look at. While teaching in Modena Italy, for Quilt Italia, I was walking the streets in Milan and saw beautiful iron scroll worked balconies. I drew the pattern up and became fascinated with bias tape. Fascinated so much that I wrote a second book titled "Bended Bias Appliqué" that shows how easy bias tape can enhance your appliqué or pieced quilts without looking like stained glass. That little child in me still lives. She is my muse. I am told that I have the face of an angel but the personality of harmless, fun mischievousness…. I have a huge grin on my face! When I was younger, I eagerly devoured books. Nancy Drew, the Encyclopedia (yep, you read right), and that big book of Grimm’s fairy tales. My curious nature wanted to know "Why would a big egg sit on a wall if it knew it could fall and get cracked", or " Why oh why would little Jack Horner stick his thumb in a Christmas Pie and say what a good boy am I?" If I did that, my mom would have a whole lot to say and it wouldn’t be anything about being a good girl! And that is how my third book "Quilted Fairie Tales" was written, and quilts designed for it. It was my quest to write my own Fairie tales. I love to write with a passion and what better way to blend the two? Did you know that there is a very special fairie that comes to the forest only once a year to give all lady bugs their spots? Also, a fairie whose job is to tippy toe on the crescent moon to keep it balanced. Just a few of the appliquéd fairies and their stories from Quilted Fairie Tales! I am so blessed to have stumbled upon a career of educating quilters through classes and lecturers. I get to travel around the world, meet the most interesting people and take some of the most amazing pictures, another passion of mine. My classes are contagious to humor and laughter. I believe that my job as a quilt educator is to motivate and encourage quilters. My method of appliqué is freezer paper and glue stick and I guarantee that everyone who takes a class from me, goes home an Appliquer! Workshops are always light hearted, and friendships are formed before class lets out. I believe in a positive attitude that you can do this, you can appliqué; you just need to be patiently taught…laughter included! Drum roll please…Win an autographed copy of Quilted Fairie Tales by posting a comment here. Include in your comment how many pairs of scissors you think I own. March 1st I will post a picture of my scissors on my blog and announce a winner. Double drum roll… Win an autographed copy of Bended Bias Appliqué by posting a comment that you read my article here and take a guess at how many pincushions I own. On March 1st, I will post a picture of the pincushions and announce a winner. 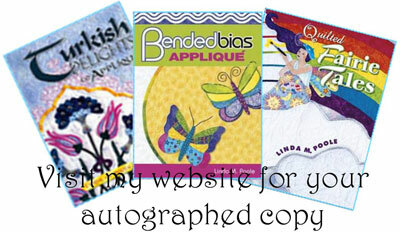 BIG BONUS… Email me that you read my Guest Blog and receive 15% off Quilted Fairie Tales and/or Bended Bias to Appliqué. (Autographed of course) US residents add $2.00 per book for media mail shipping. Out of country residents will get an email back on how much shipping will be. I accept PayPal, or check. I hope that our paths cross, perhaps at a quilt show, a quilt shop, or at your own guild where I will be teaching and lecturing. If your guild is looking for a workshop/lecture, I’d be honored if you suggested my name. It’s all about word of mouth, and the quilts. Oh yes! The quilts I bring are plentiful!!! If we meet, be sure to tell me you read my guest host blog….a hug is inevitable! I love the fairy book…I think I own about 15 pairs of scissors of different types. Don’t tell my husband. Yes Linda, I did read your guest blog here and I think you might collect pincushions. I might start myself. I’m guessing you have 17 pincushions. 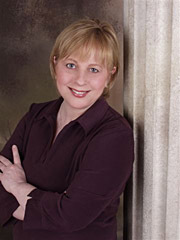 Hi Linda: Great guest blogging here. I bet you must have 24 pairs of scissors. I know I have at least that many myself. Never have them all in one place so it’s really hard to count. hmmm…I think I’ll guess on both. I think you have 13 pin cushions and 16 pair of scissors. I find it amusing that almost every “serious” quilter becomes a collector of various quilting items. I know I have. I can’t get enough fabric, magazines (I have to know what is going on), tools ( I have to try them out),and now web sites and blogs( there may be a new technique I want to use). I love every minute and am proud to be among others who are just as obsessed with quilting as I am. What a great sory you have of sharing with you Nona! Reading your guest blog was fun! I think you have 39 pair of scissors and 32 pin cushions! Well, it is a guess! I always love to read about your ambition, talent and sunny personality. Now is that fair to re-release Turkish delights on cd, but what a great thought! Anyway I am sure you have more but I am guessing you have 4 pairs of scissors and 27 pincushions. Your early childhood could be mine….so much of it is the same…of being taught first one craft than another….I couldn’t get enough either! Both books would be fun, but Fairies call to me…ahhh…so my guess is 18 pairs of “cutters” and if people add to your pin keepers my guess is 99! Hi, Gee, one can never have too many pairs of scissors. I’m guessing 56. I don’t collect them and have at least 20 and am always within 5 feet of a pair. Hi Linda… I love the fairy stories.. your story is one of the best guest blogger stories I have read. While my story differs slightly, as I had no artist/crafters in my family, I did ‘borrow’ inspiration from my friends moms… I tried just about every craft out there until I stumbled into quilting. I even taught crocheting/knitting at the ripe old age of 13, as my first afterschool job. So scissors I will quess 25 and pincushions about 50. I hope I win :-)! But either way, keep inspiring others with your art. Wow! I am blushing girls. Thank you so much for all these sweet comments. I know I am in good company after reading how many scissors and pin cushions you all own! Keep the comments coming……but remember to comment on my blog too. If you like, you can become a follower of my blog or subscribe to it. Those of you who own my books, I hope you are enjoying them. I wrote them with “you” in mind! I enjoyed reading about your life. I will guess that you have 28 pairs of scissors and 80 pin cushions. Love your vibrant and positive personality. Since I don’t even collect sissors, but have about 30 pair, including kitchen sissors and gardening sissors, I’m guessing you have about 101 pairs of sissors. Pincushions is a harder guess. I’m going to say 150. I do hope you will post the correct answers on Quilt Art. PS. I’ve really enjoyed reading about you. Oh boy – lets not confess about collecting quilting stuff! My worst would probably be books, magazines…. I am going to guess that you have 26 pairs of scissors and …47 pincushions! Linda, it was so much fun to read more about you and I loved the picture of you as a young girl. I already have your books and enjoy them all. But I will guess, too, and think that you have 15 scissors and 20 pincushions. Okay, I think 17 pair of scissors and 93 pin cushions. Hi Linda, I own all your books but I couldn’t help reply, I know I own in excess of 25 scissors and am sure you do also! I am very short in the pincushion area, I don’t own one. Guess I should have made a Cupcake Pincushion, but I am betting you own lots and lots of Pincushions about 15 at least. The picture of you as a child is priceless, it was great fun to read about your begining, I too had a Nona and even though she never spoke english she taught me many things. Thank you for sharing part of your history with us. I’m going to venture a guess that you have 11 pairs of scissors and 17 pincushions (and you didn’t ask, but I’m guessing you have 97 needles buried inside those pincushions that you don’t know about). Hey Linda, bet you have scissors in every color of the rainbow plus some. I’ll say 13. Fun and colorful pincushions for each style of straightpin maybe 10. I have all your books with autographs! Be happy. TA DA!!! I have a winner and also a tie for my book give away!!!! Go check out my blog to see if you are a winner. If you are the one, please email me!!! Oh….and there’s alot more on my blog too!!! Please do leave me a comment there! I’m guessing you have 28 scissors and about 58 pincushions. Have fun using them! Hi Linda, Hmmm….fairy tales, Nancy Drew, encyclopedias–sounds just like me as a child – could we be related? I loved reading your story! Thanks much and I’ll be looking for your books because I adore doing applique and enjoy collecting quilting books (along with collecting scissors, fabric, and notions of all kinds. “A girl can never have enough notions!”) but no pincushion…… yet. Hello Linda, I have just discovered you as an artist and quilter. I ran across this blog and thoroughly enjoyed reading all about your history as an artistic child to currently teaching applique. I am guessing 76 scissors and 127 pincushions. Happy artistic creativity to you!